Strong, light and useful, Daytek laundry trolleys take the heavy lifting and bending out of getting your washing from the machine to your Daytek Clothesline or Daytek Airer. Made from powder coated steel, the Daytek Trolley comes as a standard model or as a Plus version with integrated Peg Basket and an extra-tall frame. An safety catch prevents the trolley from collapsing while in use. 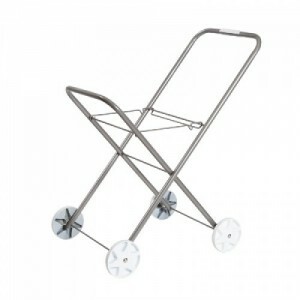 The Daytek Laundry Trolley suits most laundry basket sizes.